Goldsboro nuclear accident declassified document: U.S. nearly nuked North Carolina. 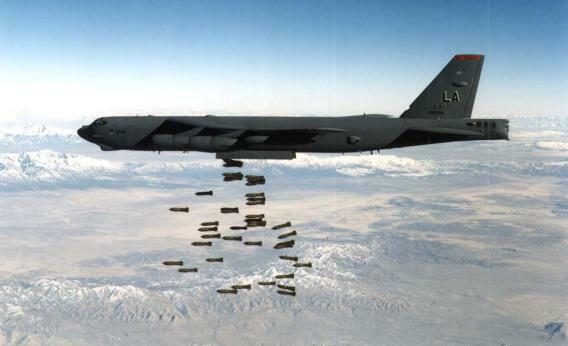 A U.S. Air Force B-52 Stratofortress heavy bomber drops bombs in this undated file photo. In 1961, a Stratofortress broke up over rural North Carolina, dropping a pair of atom bombs in the process, one of which nearly detonated. Remember fallout shelters? Air raid drills? Duck and cover? At the height of the Cold War, Americans lived in perpetual fear of a nuclear attack by the Soviet Union. But perhaps we were afraid of the wrong side. A declassified document obtained by author Eric Schlosser sheds new light on the 1961 Goldsboro accident, in which a U.S. Air Force B-52 broke apart in midair over North Carolina, dropping a pair of Mark 39 nuclear bombs on the countryside below. The accident is not news, but just how close the military came to wiping out a swath of the Eastern Seaboard has long been debated. For years the military insisted that the hydrogen bombs were never in danger of detonating. The secret document, written by a nuclear weapons safety supervisor in 1969 and first published by The Guardian today, makes it clearer than ever that was not the case. In fact, three of the four safety mechanisms on one of the bombs were unlocked in the course of the fall. By the time the bomb reached the ground, the only thing preventing it from detonating was a single, simple, low-voltage switch. A short-circuit of that switch as a result of the mid-air breakup—“a postulate that seems credible,” the supervisor writes—could have resulted in mass destruction. The Mark 39 bombs, Schlosser notes in his new book Command and Control, were some 250 times as powerful as the device that the United States dropped on Hiroshima. Nor was this the only time the United States came heart-stoppingly close to blowing itself up by accident. Schlosser’s book begins by recounting a mishap in Damascus, Arkansas in 1980 in which a dropped wrench nearly detonated a nine-megaton thermonuclear warhead carrying more explosive power than all the bombs dropped during World War II, including the nukes. When we think of nuclear near-misses, we often think of the times in the Cold War when the United States and the Soviet Union stood nose to nose with missiles poised. It’s hard to assess how likely that was in hindsight. But it should be clear by now that the U.S. military came far closer to detonating a nuclear bomb on American soil than Kruschev ever did. Correction, Sept. 20, 2013: This post originally stated that the thermonuclear warhead that nearly detonated in Arkansas in 1980 was 100 feet tall. Rather, the Titan missile that housed the warhead was 100 feet tall.